If you are a homeowner or renter whose home or belongings were damaged or destroyed in a disaster, you might be eligible for financial assistance from the U.S. government. 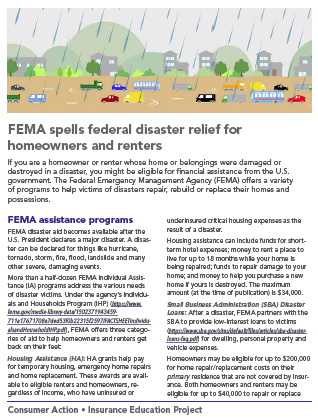 The Federal Emergency Management Agency (FEMA) offers a variety of programs to help victims of disasters repair, rebuild or replace their homes and possessions. FEMA disaster aid becomes available after the U.S. President declares a major disaster. A disaster can be declared for things like hurricane, tornado, storm, fire, flood, landslide and many other severe, damaging events. Housing Assistance (HA): HA grants help pay for temporary housing, emergency home repairs and home replacement. These awards are available to eligible renters and homeowners, regardless of income, who have uninsured or underinsured critical housing expenses as the result of a disaster. Housing assistance can include funds for short-term hotel expenses; money to rent a place to live for up to 18 months while your home is being repaired; funds to repair damage to your home; and money to help you purchase a new home if yours is destroyed. The maximum amount (at the time of publication) is $34,000. Small Business Administration (SBA) Disaster Loans: After a disaster, FEMA partners with the SBA to provide low-interest loans to victims for dwelling, personal property and vehicle expenses. Homeowners may be eligible for up to $200,000 for home repair/replacement costs on their primary residence that are not covered by insurance. Both homeowners and renters may be eligible for up to $40,000 to repair or replace damaged or destroyed personal property (clothing, furniture, appliances, vehicles, etc.). Loan approval is dependent on credit score and ability to repay. If you are denied a loan, your application will be referred back to FEMA for other types of assistance. You or at least one other household member must be a U.S. citizen, non-citizen national or qualified alien. FEMA must be able to verify your identity and your homeownership or rental occupancy. Your disaster-related needs are not covered by personal insurance or any other form of disaster assistance (no duplication allowed). Your necessary expenses and serious needs are a direct result of a declared disaster. The damaged residence was your primary residence at the time of the disaster. Eligibility criteria are set by law and are the same for all disasters. Note: National Flood Insurance Program (NFIP) policyholders—anyone who has purchased separate flood coverage offered through the federal government—should contact their agent first, and then register with FEMA. If you're not sure who your insurer is, call 800-621-FEMA (3362). While an NFIP policy does not cover temporary housing or additional living expenses, FEMA’s Individuals and Households Program does, so it’s important to register with FEMA even if you have flood insurance. You can complete your FEMA registration by phone (800-621-FEMA ; TTY: 800-462-7585), online, or in person at a disaster recovery center (click the “Find a Disaster Recovery Center” link at FEMA.gov to find the closest one). Smartphone users can download the FEMA app. Be prepared to provide your location, Social Security number, contact details, income, bank account and insurance information, and the extent of the damage. After completing the registration process, you will receive a nine-digit registration number for use when corresponding with FEMA; keep it on hand. By creating an online account at the end of the process, you will be able to check your application status at any time. If you receive an SBA loan application after registration, you must fill it out (online or by phone [800-659-2955]), even if you don’t want a loan. This form is required if you want to be considered for other types of assistance. If your loan application is approved, you can accept or decline the loan. If your application is not approved, it will be referred back to FEMA for any other available assistance. After you register, you will get a call from FEMA to schedule an appointment for a home inspection. When the inspector arrives, verify his or her identity to avoid scams; all inspectors carry official FEMA photo identification. Likewise, you will have to present valid photo ID and proof that you own or rent the property (a recent bill or statement showing your name and the property address, for example). Note: The documents you might need could be destroyed or inaccessible after a disaster. Prepare by creating a home inventory, digitizing important documents, and storing all this, plus account usernames and passwords, in the cloud, where you can access them at any time, from anywhere. Disaster victims who have filed for assistance with FEMA and have homeowners or renters insurance must submit documentation of their insurance settlement or denial before FEMA assistance is considered. If FEMA confirms that partial or no coverage was provided by your personal insurance, your application for disaster assistance will be processed. If full coverage was received from the insurance company, FEMA would not provide any additional funding. If there is a delay in receiving insurance coverage, FEMA may advance you money, which you would have to repay once you receive your insurance settlement, if it covers all your losses. If the insurance settlement falls short, you might not be required to repay the FEMA advance. If FEMA denies your request for funds and you disagree with the agency’s decision, you have the right to submit a written appeal requesting review of your case. The assistance FEMA provides is limited and intended only to meet survivors’ basic needs and start them on the road to recovery. FEMA assistance is not intended to be a substitute for personal homeowners and renters insurance, and could fall far short of what you need to repair, rebuild or relocate. FEMA assistance also does not provide any money for repairing or rebuilding second homes, and it doesn’t usually cover repairs or replacement of valuables or electronic items like computers unless that item was essential to your employment (for example, if you are a freelancer working from home). If you are a homeowner or renter and do not have insurance, or you think you might be underinsured (low coverage limits, or in need of additional flood or earthquake coverage), take steps now to get adequate coverage in place. If a disaster strikes, it will be too late. If you have insurance of any type (homeowners, renters, flood or earthquake) and you are the victim of a disaster, you must contact your insurer to file a claim first, and then register for FEMA disaster assistance. See our companion fact sheet, Homeowners and renters insurance: What you need to know before and after a natural disaster, to learn more about insuring yourself against a disaster.